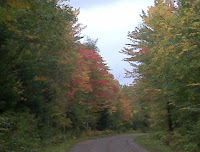 Here's a shot of the foliage in WI right now. You can't see it, but the weather was 58 deg and rain. All the hunting parties, including me, had a poor day. Ace locked up on a bird 30 yards off the trail and it held until I got there. The flush was left to right (I'm a lefty- so this was a good thing) and I was mentally putting this bad boy in my bag and pulling the trigger on the Fox when...oops, where did that sapling come from? The barrel hit the tree just as the gun fired. I still have the mental image of that grouse and I swear he was looking right at me- and laughing! I figure if you take this grouse hunting personally, you'll be a bitter old man in short order. So, my philosophy is- I've never had a bad or unsuccessful day in the field. Period. If you measure your success by the size of your game bag at the end of the day, you are going to end up giving up this sport. I have some friends that ask me, first thing, all the time when I get home, "How many birds did you kill?" "All of them I could! ", I'll answer. Tomorrow, I know a great spot and I'll bet its loaded with birds!